I'm attempting to eat around the world without leaving London and this week I had Syrian food at Abu Zaad on Edgeware Road. 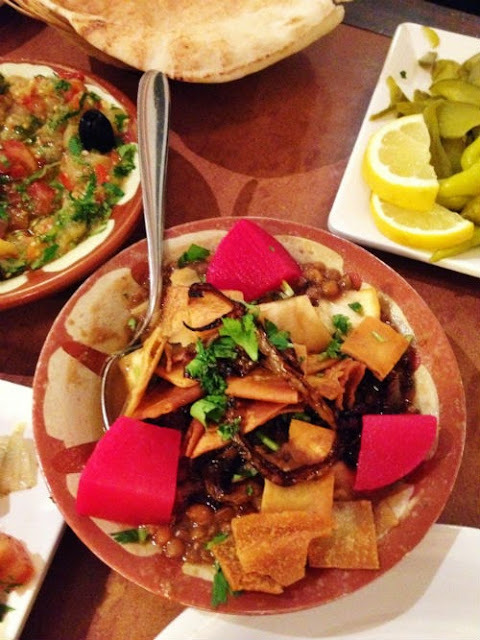 So far it's been a bit of challenge to see whether a restaurant really serves authentic ethnic dishes, but for this post I was lucky to have the proper Syrian experience as I brought my friend and his Syrian girlfriend. Even though the waiter was trying to get us to order the standard Middle Eastern fare like houmous and vine leaves, we went for the real Syrian stuff. We started off with a mixture of hot and cold appetisers. 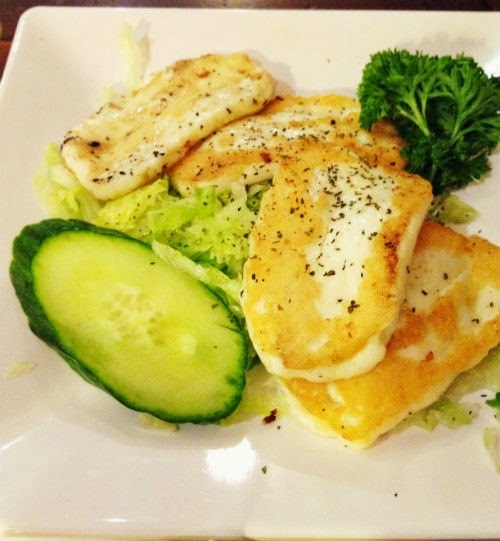 We had a plate of grilled halloumi cheese slices, which I love for its salty flavour and squeakiness as you chew on it. We also had a dish called hara isbah, which consists of strips of pasta that are cooked with tamarind and lentils and mixed with fried pieces of crisp bread. It's cooked in water, lemon juice, garlic and olive oil then topped with fresh coriander leaves. Next was the fattet Makdous, which is a specialty of Damascus is made by layering crispy flatbread which is covered by a tomato sauce flavoured with yogurt, tahini, pomegranate molasses and crushed garlic. This is then topped with meat and nut mixture and deep fried aubergines stuffed with meat. 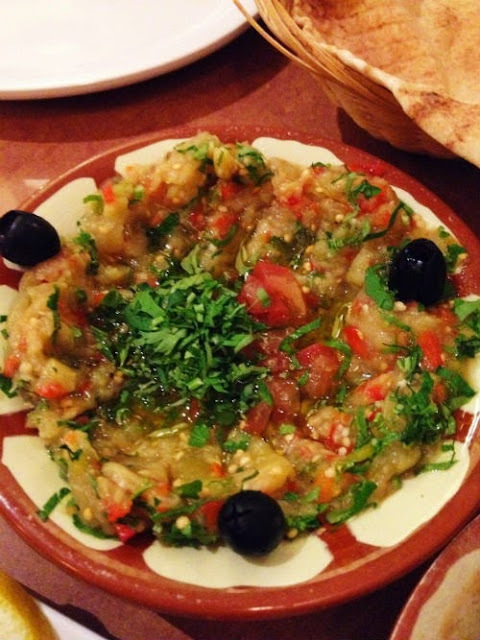 We also had baba ganouj, which consists of the pulp of flamed baked aubergine mixed with fresh pepper, parsley, garlic, lemon juice and olive oil. Great for dipping bread in. 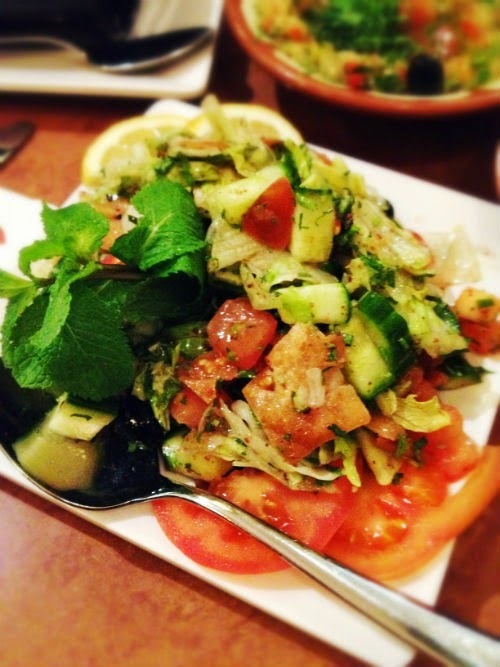 There was a dish called fattoush which is a salad of lettuce, cucumber, tomato, mint, summak and fried cubes of pitta bread, drizzled with a lemon and olive oil dressing. It was hard to leave space for the mains we'd ordered as well as it all tasted so morish. 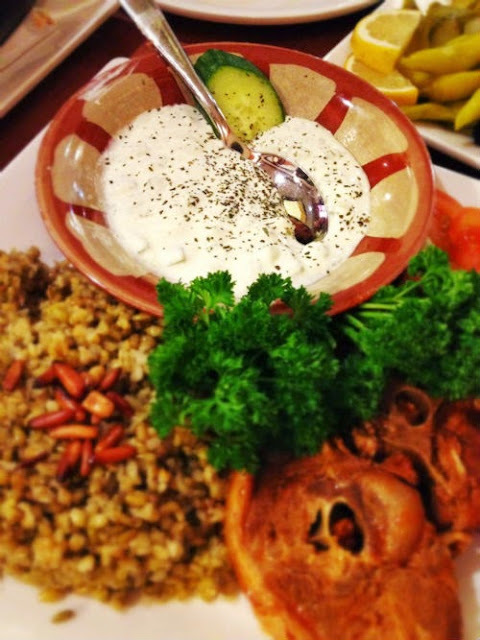 The three of us shared a dish called freekeh, which is a green wheat that is cooked and served like rice. This one came with, spiced lamb, onions, peas garnished with fried almonds and a yogurt, cucumber and mint salad. The second main was called makloba, another very Syrian meal. 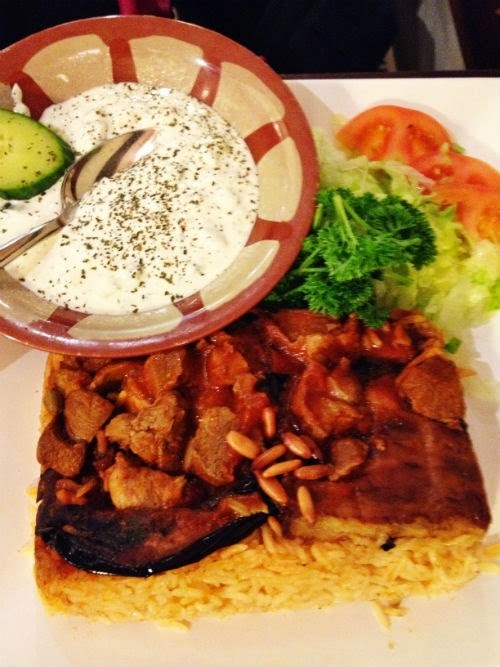 It is special cooked rice covered with aubergine, pine nuts and lamb and the same yogurt, cucumber and mint salad. We did a good job eating till we could eat no more, which is when the waiter came over with a complimentary dessert called muhallabia. It's a sweet milk based pudding flavoured with orange blossom water and topped with ground pistachios. Very sweet in every sense of the word. It was an amazing meal and it goes to show that Middle-Eastern food is not just about houmous and stuffed vine leaves. No matter what the waiters say.